Opening in the surrounding woods of Galway, Ireland in 1963 a hunting party of five families is tracking an evil that could kill swiftly. The Banshee, a female spirit who acts as a messenger from the Otherworld, the Celtic home of the dead. The mere sound of her scream signals that a death will come in your family or someone close by. The mob believe they are tracking her but is it her who is tracking them? The only way to get rid of the curse to the families is to bury a box with a Ouija board inside. A young lad Danny is chosen to bury it as he is not one of the cursed family members. On returning to his comrades he finds that he is the lone survivor of the Banshee. 50 years later we see a trio of young girls recover the box and bring it back to the family home. Realising the danger that is to be brought to the family, an elderly Danny sends his family away and calls in a demon hunter and his young protege to his home. Danny relays his story of the Banshee and with promise of payment they hunt the beast but is Danny to be trusted? Writer/director Stephen Patrick Kenny (CAPTIVE) brings a touch of Irish folklore to life and mixes it up with a feeling of the classic period of Hammer films. This is a short film that delivers the goods in its time frame and leaves you wanting more. 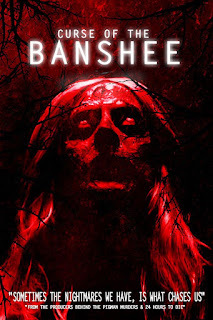 Kelly Whitehouse's music adds a touch of the eerie and macabre especially in scenes where the Banshee is involved. Talking of the Banshee you only get mere glimpses of her which adds to the mystery of her presence and when or where she will strike next. Watch this film on a cold windy day to add an extra bit of chill to your viewing.